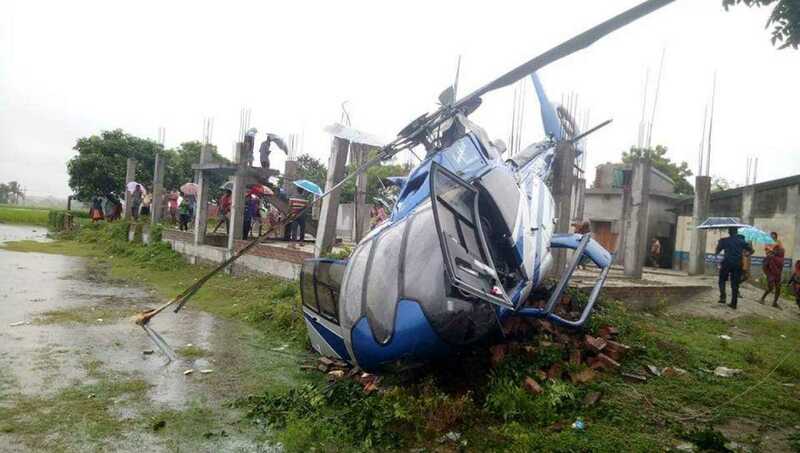 Photo: Crashed helicopter in Godagari uapzila of Rajshahi. Dhaka, Oct 11 : Six people, including Impress Telefilm’s Managing Director Faridur Reza, escaped unhurt as a helicopter of Impress Aviation Ltd crashed in Godagari uapzila of Rajshahi on Thursday. Channel I director Shykh Seraj told that the accident occurred when a team was returning to Dhaka after shooting of a ‘Sarnakishori’ programme for the channel in the afternoon.